We cannot believe our 2015 Year in Review Blog Series is coming to an end! 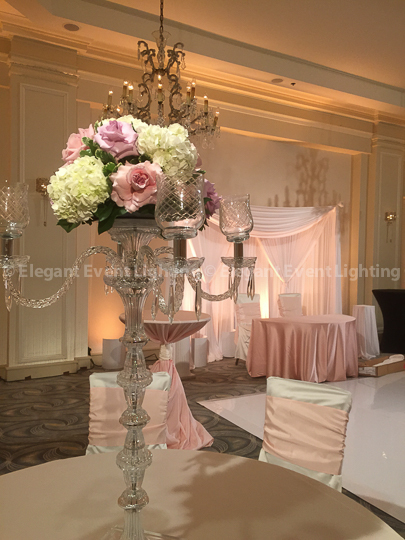 We had fun recapping some of our favorite lighting and décor designs with you to highlight what a wonderful year we had at Elegant Event Lighting Chicago! For our final post, we are sharing some of the amazing room transformations that we had the opportunity to create for our couples this year! 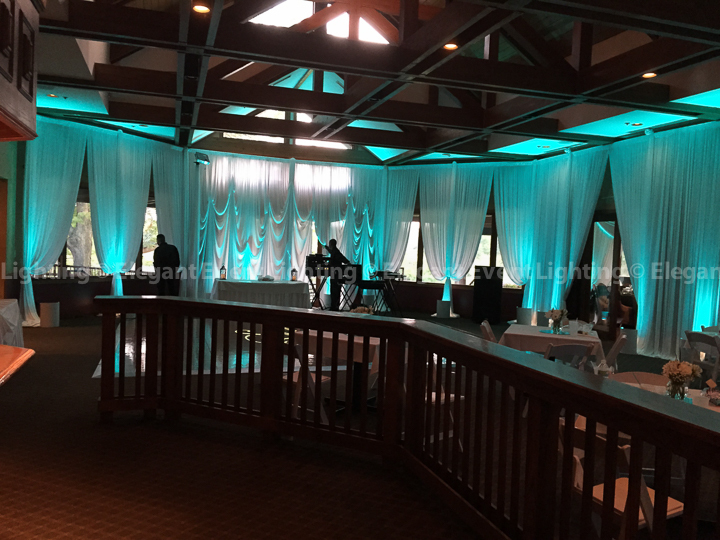 Schenieka & Will had a beautiful Wedding Reception on Saturday, July 4th, 2015 at Seven Bridges Golf Club in Woodridge, IL! Schenieka & Will’s guests entered their reception through a dramatic white fabric curved drape entrance that was illuminated in beautiful Oasis Blue uplighting. The couple’s custom lighting and décor design continued with gorgeous white fabric draping that lined all of the window walls in the Gallery & Grill Rooms. 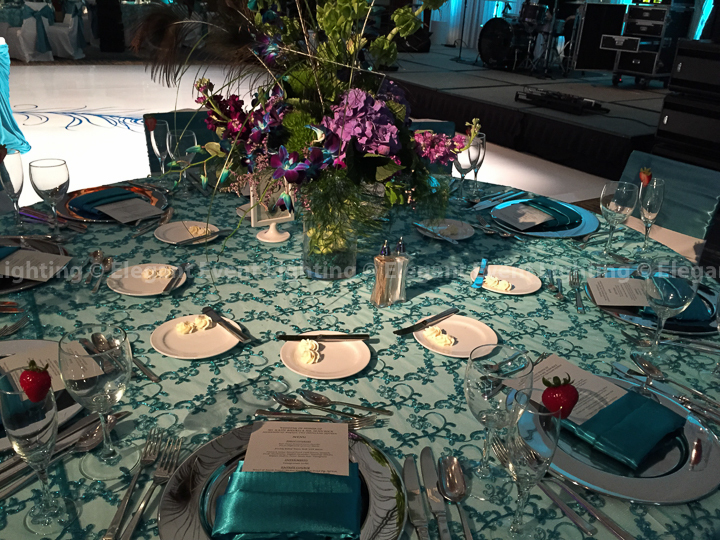 The Elegant Event Lighting Team incorporated an ornate design behind the couple’s head table. 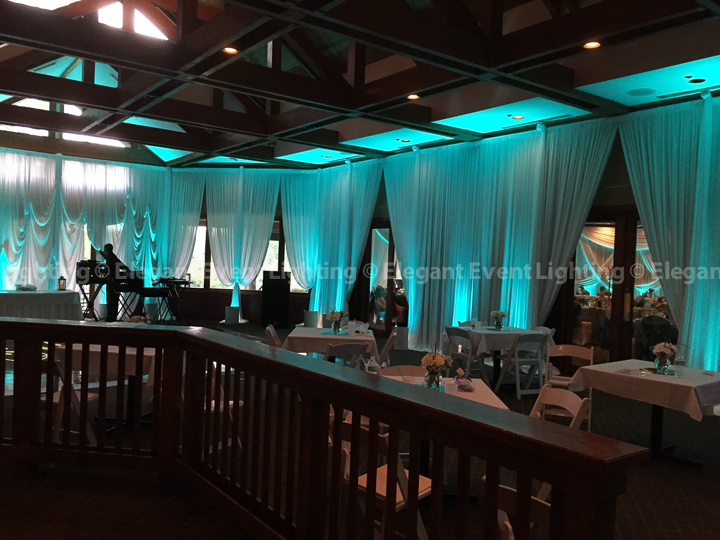 We love the pop of color that the Oasis Blue uplighting added to the Gallery & Grill Rooms! 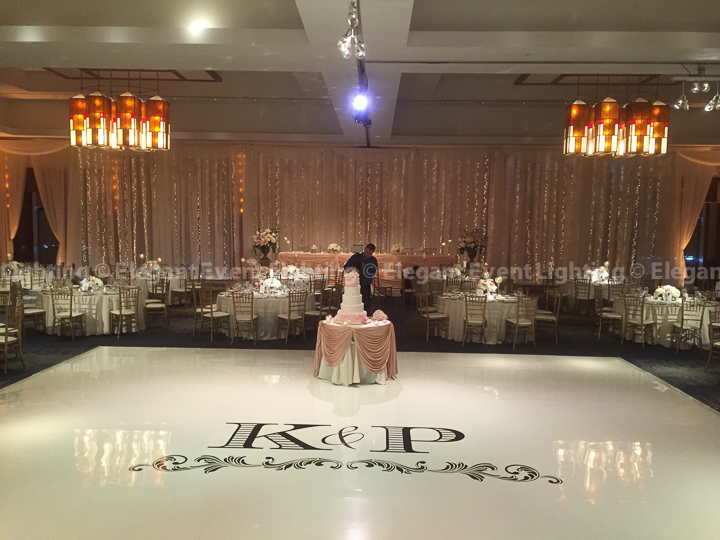 To put the finishing touch on Schenieka & Will’s lighting and décor design, Elegant Event Lighting shined the couple’s custom bride and groom monogram on the dance floor! 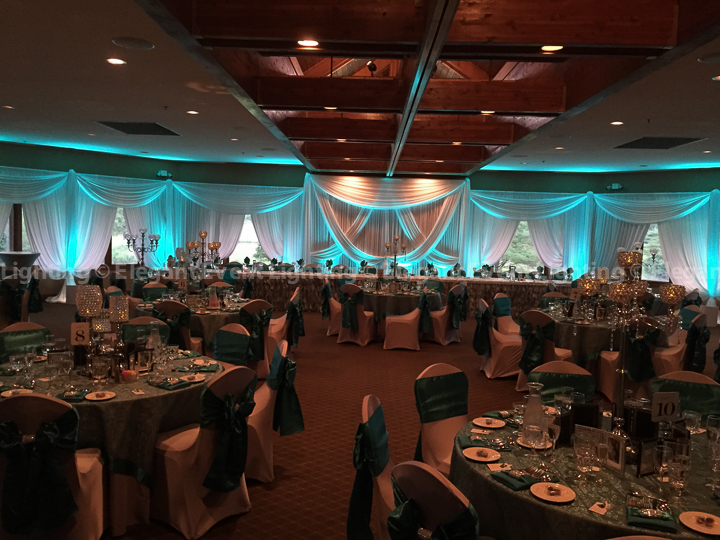 Click here to see Schenieka & Will’s Wedding Reception Room Transformation! Katie Biedess & Sean Bock hosted their beautiful Wedding Reception on Saturday, August 15th, 2015 at Eaglewood Resort & Spa in Itasca, IL! We loved with working with this wonderful couple and the Mother of the Bride, Pat to bring their lighting and décor visions to life! Guests were welcomed into the Red Oak Ballroom at Eaglewood Resort with a beautiful white fabric backdrop that adorned the bridal party head table. 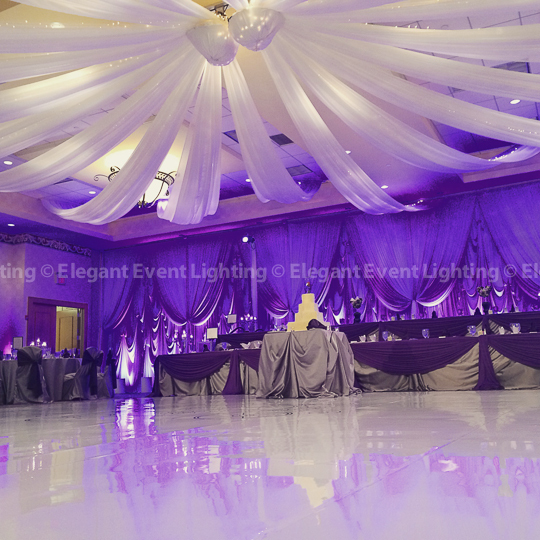 The backdrop’s beautiful swags and pleated design were highlighted with lavender uplighting. The couple shared their first dance on a brilliant high gloss white vinyl dance floor. We love the jade blue peacock feather overlay the couple chose for the center of the dance floor! 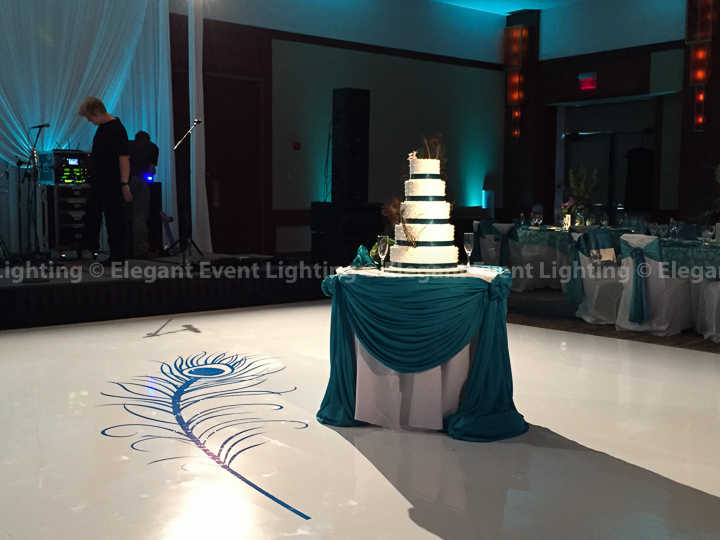 Downlighting in soft blue and white shades accentuated the high gloss vinyl cover, feather overlay and wedding cake. We love how this lighting element brought the dance floor into focus for Katie & Sean’s guests. 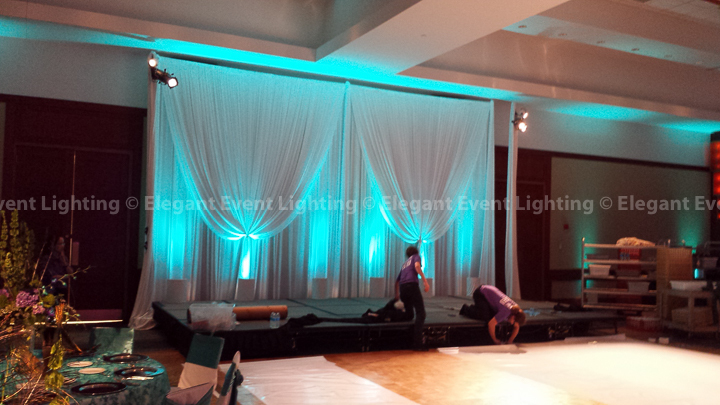 The band stage was highlighted with a white fabric backdrop bathed in jade blue uplighting. 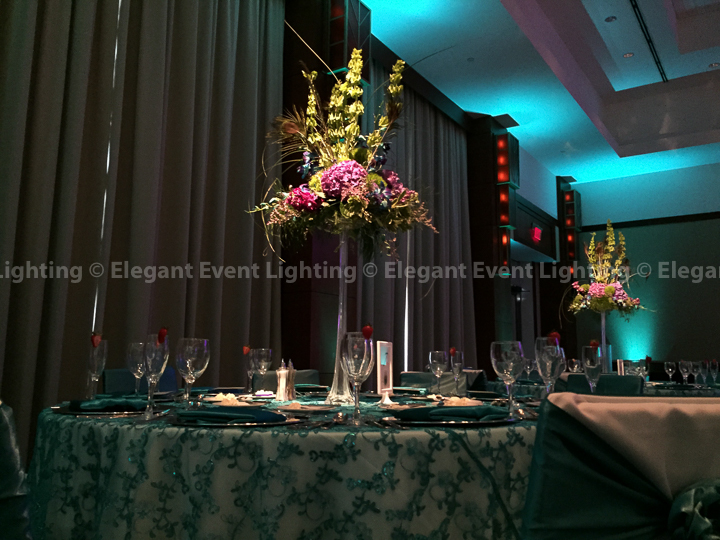 Matching jade blue uplighting illuminated the perimeter of the Red Oak Ballroom. Katie & Sean’s floral table centers were accentuated with pin beam lighting. 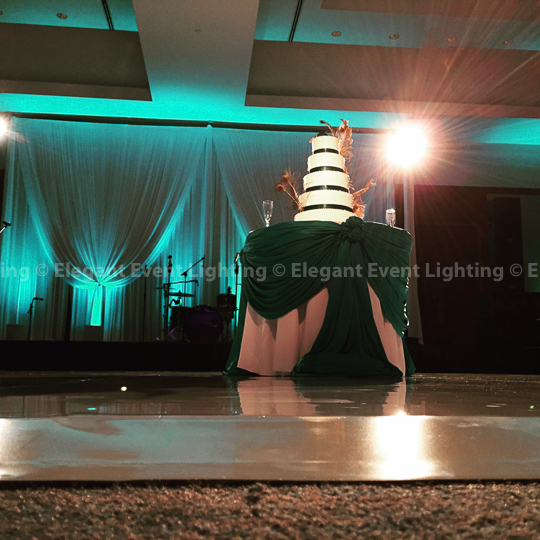 To put the finishing touch on the couple’s custom lighting and décor design, our team swagged the bridal party head table and cake table in jade fabric. Click here to learn more about Katie & Sean’s Room Transformation! 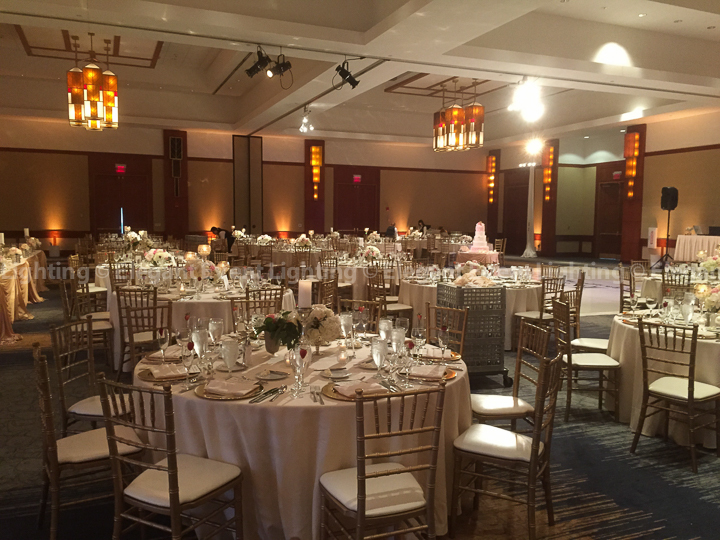 Samaneh Dowlatshahi & Amir Afshar had a gorgeous Wedding Ceremony & Reception on Friday, May 29th, 2015 at the Hilton Orrington in Evanston, IL. 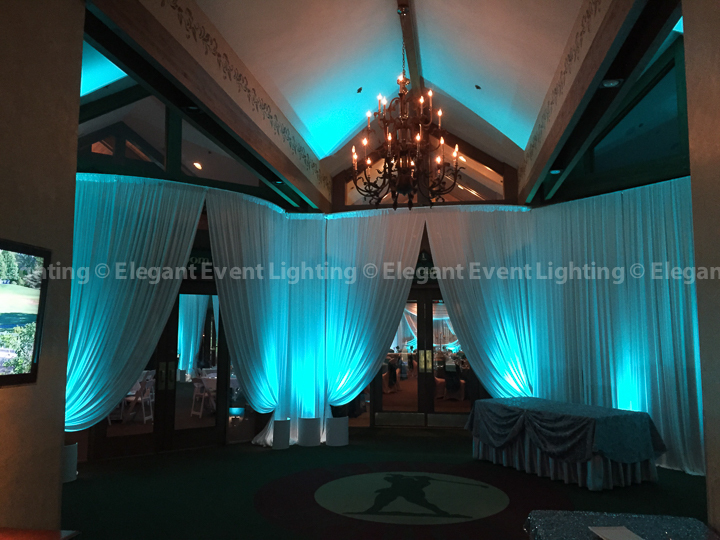 Elegant Event Lighting loved working with this couple to bring their lighting and décor vision to life for their special day! 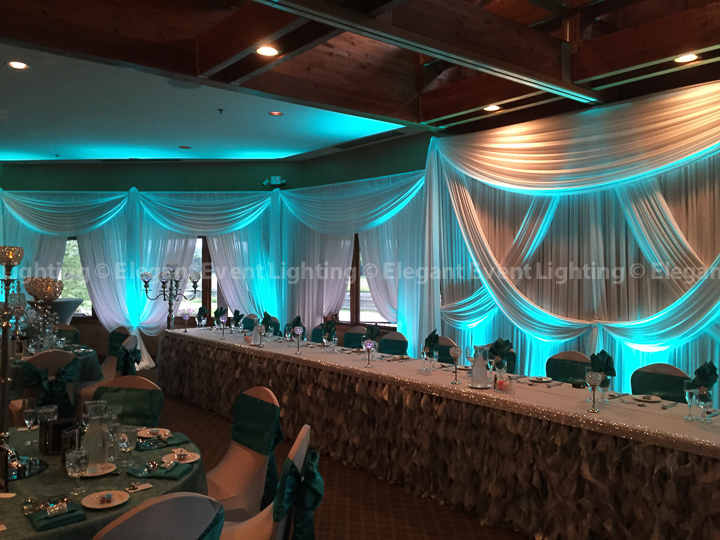 Samaneh & Amir’s custom lighting and décor design began in the Mulford Room for their ceremony. The Elegant Event Lighting Chicago Team transformed the back wall of the Mulford Room using soft white draping bathed in soft white lighting to create a backdrop for the couple’s Sofreh Table. The EEL Chicago Team softly downlit the Sofreh Table for the viewing pleasure of guests and to illuminate all of the table décor. After Samaneh & Amir’s ceremony, their guests were welcomed into the Heritage Ballroom for the reception with a white fabric backdrop that adorned the sweetheart table. 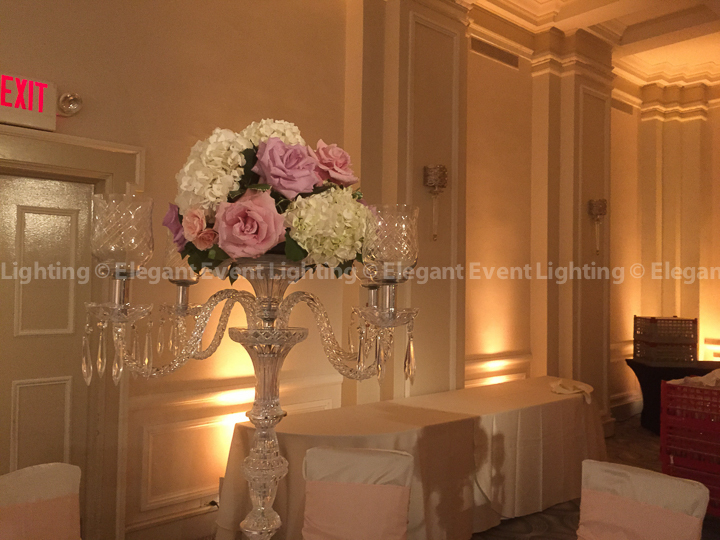 The Elegant Event Lighting Team illuminated the sweetheart table and the perimeter of the Heritage Ballroom with amber uplighting. We love the warm ambiance this lighting element created for the couple’s reception! 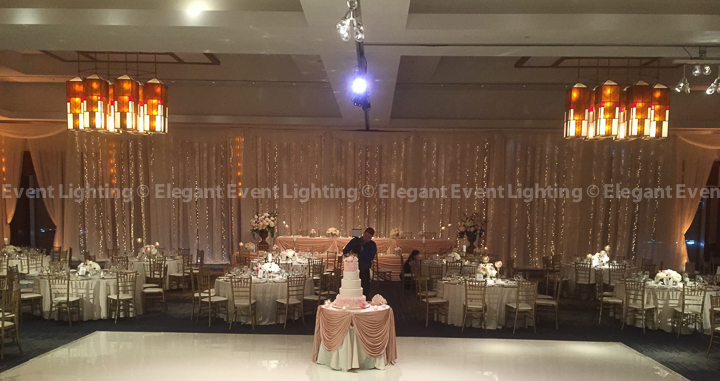 Samaneh & Amir’s lighting and décor design continued with a seamless, high gloss white vinyl cover of the Hilton Orrington’s wood dance floor. To make the high gloss vinyl cover ‘pop’ and focus guests’ attention for the evening’s special dances, the EEL Chicago Team softly downlit the dance floor. To put the finishing touch on Samaneh & Amir’s custom lighting and décor design, the Elegant Event Lighting Team used pin beam lighting to enhance the floral centerpieces at each of the guest tables. 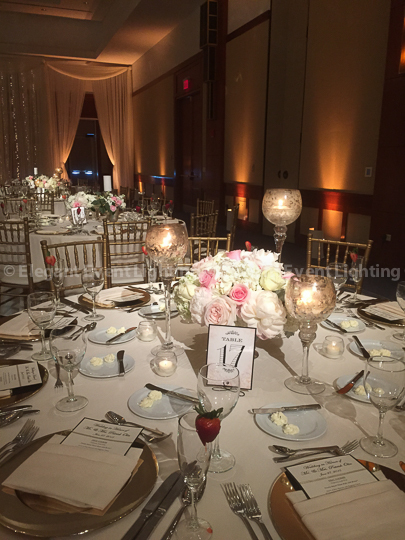 Samaneh & Amir’s custom lighting and decor design was beautiful and truly personalized the Heritage Ballroom for their reception! Click here to see Samaneh & Amir’s complete Wedding Ceremony & Reception Room Transformation! 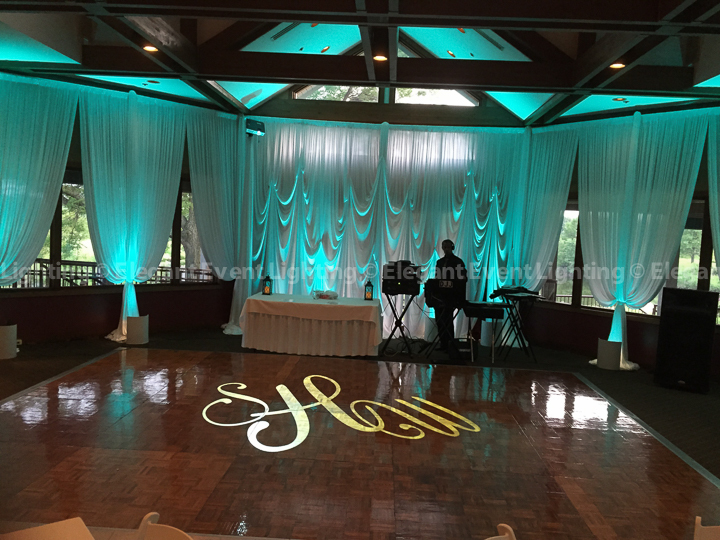 Kelsey Safran & Patrick Olin had a beautiful Wedding Reception on Saturday, June 27th, 2015 at the Eaglewood Resort & Spa in Itasca, IL! 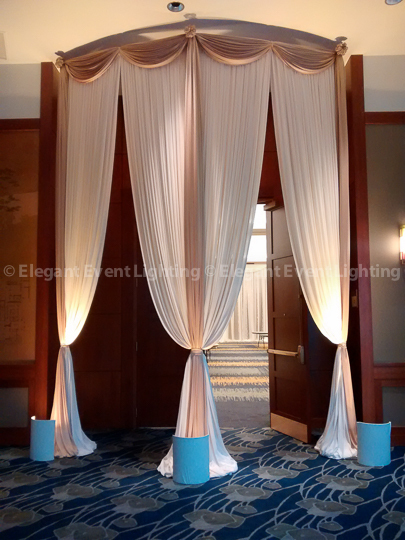 Kelsey & Patrick’s guests entered their reception through two dramatic curved ivory fabric drape entrances that were trimmed in gold. 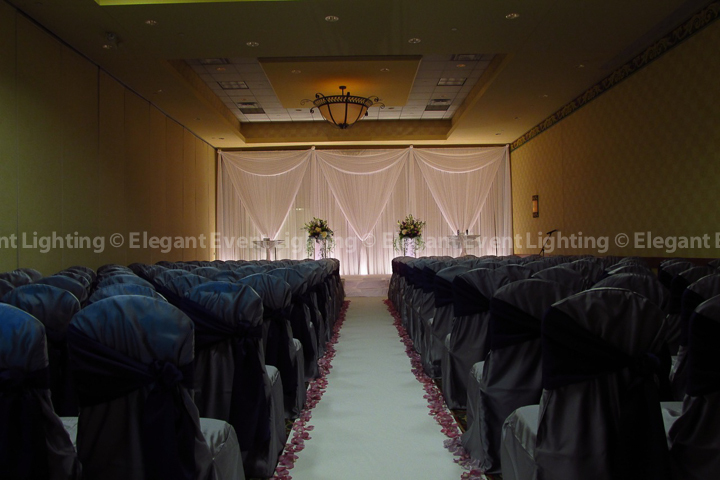 Once inside, a gorgeous pleated ivory fabric fairy light light backdrop welcomed guests into the Red Oak Ballroom. Candlelight amber uplighting illuminated the perimeter of the ballroom and coordinated perfectly with the soft glow of the backdrop’s twinkle lights. 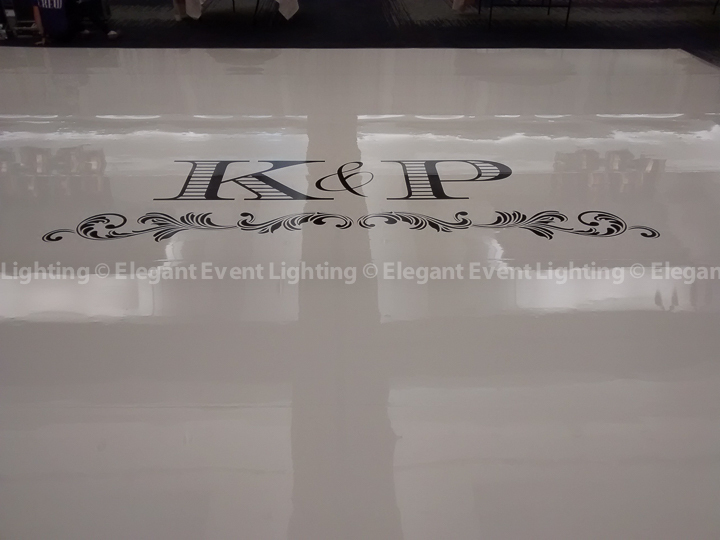 The Elegant Event Lighting Team covered Eaglewood Resort & Spa’s wood dance floor with a brilliant ivory vinyl cover and overlaid Kelsey & Patrick’s custom monogram in the center. 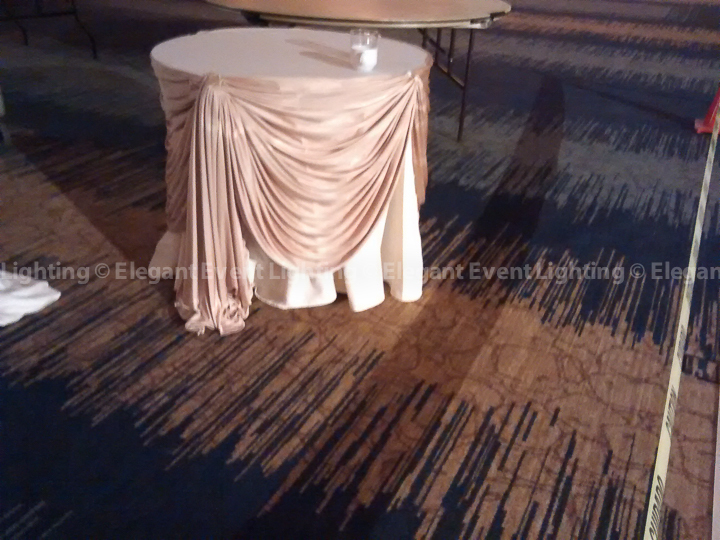 The dance floor was softly downlit to make the vinyl cover and monogram pop! Pin spot lighting enhanced all of the gorgeous floral table centers from Elizabeth Wray Design and the couple’s wedding cake! To put the finishing touch on Kelsey & Patrick’s custom lighting and décor design, EEL Chicago draped the two head tables and cake table with beautiful gold fabric. Click here for Kelsey & Patrick’s featured post on their Room Transformation! Amanda Susay & Steve Loesh had a gorgeous Wedding Ceremony & Reception on Saturday, March 14th, 2015 at Marriott Burr Ridge in Burr Ridge, IL! 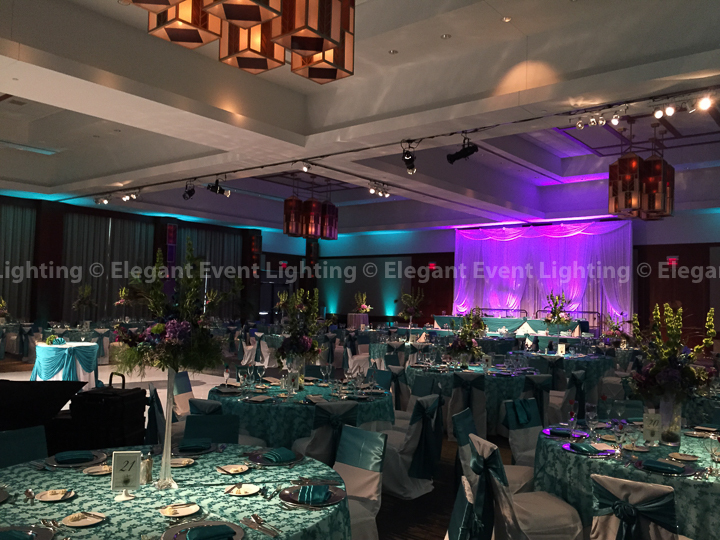 Elegant Event Lighting loved working with this wonderful couple and the Susay’s to bring their lighting and décor vision to life for the ceremony and reception! Amanda & Steve’s ceremony lighting and décor design began with a simple, elegant white fabric backdrop that created a beautiful setting for the back of the bridal altar. 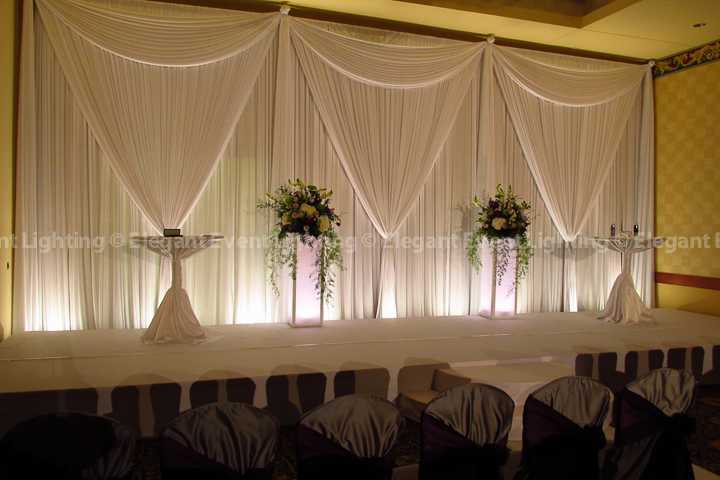 The entire length of drape was illuminated in soft white lighting. 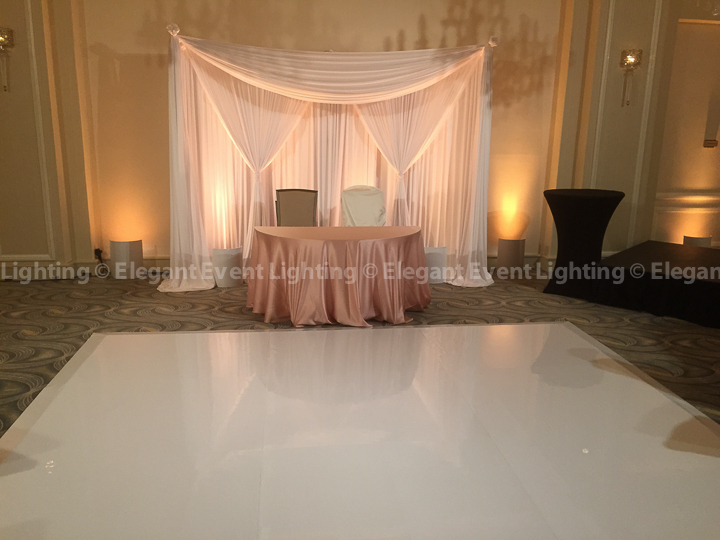 The EEL Chicago Team also covered the ceremony stage and steps in crisp white matching fabric to compliment the fabric backdrop. Two lighted flower pedestals highlighted Amanda & Steve’s gorgeous floral arrangements designed by Denise Walden at Walden Floral. Amanda made her grand entrance on our double-wide white fabric aisle runner that Walden Floral lined with flower petals. 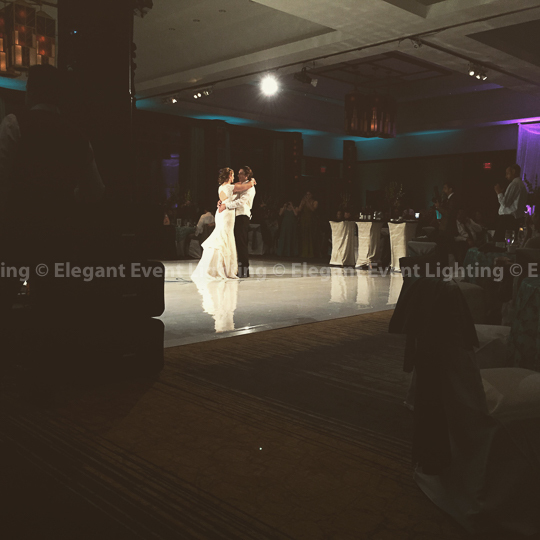 To complete the custom ceremony lighting and décor design, Elegant Event Lighting softly downlit the stage for the viewing pleasure of the couple’s guests. All of the lighting and décor elements created the perfect romantic ambiance for the ceremony. Amanda & Steve’s guests were welcomed into the ballroom for their reception with a beautiful double layer fabric backdrop that ran floor to ceiling along the wall behind the bridal party head table. 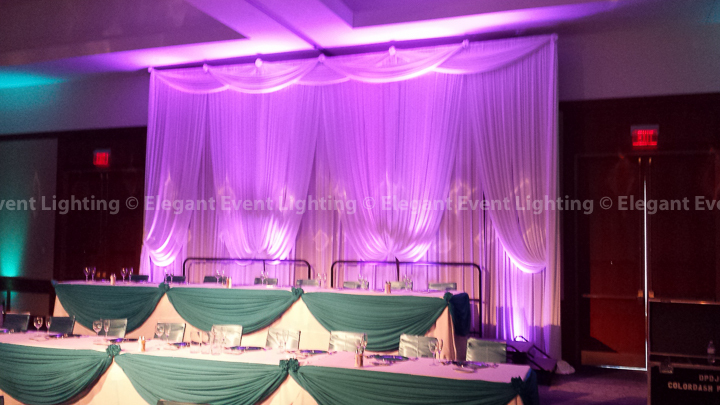 We love how the deep purple uplighting highlighted the backdrop’s fabric swags and pickups. Amanda & Steve’s lighting and décor design continued with our Signature Fairy Light White Fabric Ceiling Canopy that radiated from the center of the ballroom over the dance floor. 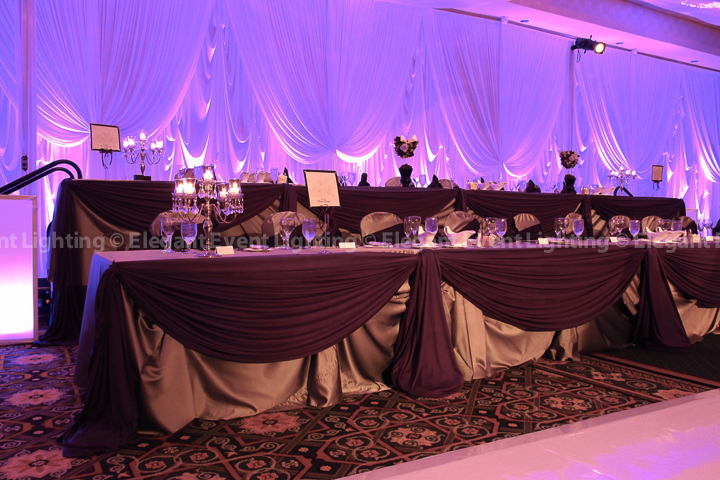 To add a dramatic pop of color, the perimeter of the ballroom was bathed in deep purple uplighting. 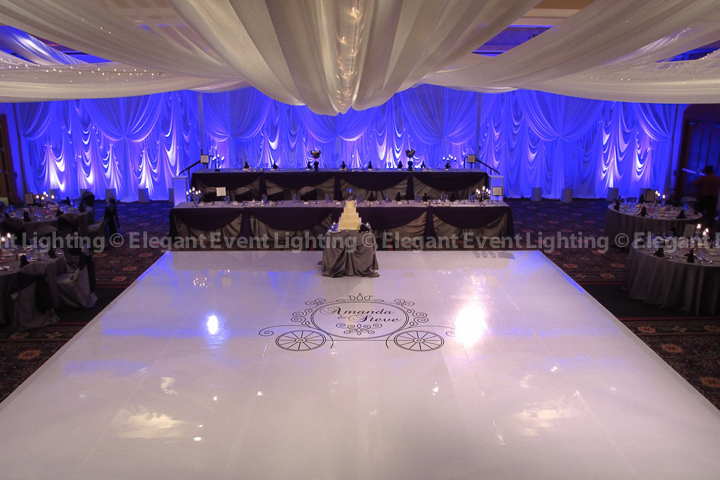 The Elegant Event Lighting Chicago Team covered the Marriott Burr Ridge’s existing wood dance floor with a seamless, high gloss vinyl cover and overlaid Amanda & Steve’s custom carriage monogram in the center. The white dance floor served as the perfect setting for the all of the night’s special dances. 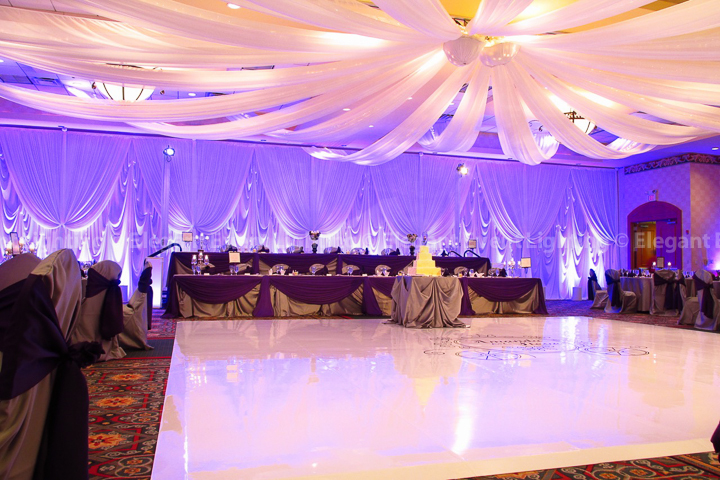 Amanda & Steve’s lighting and décor design was completed with purple head table draping and two lighted flower pedestals illuminated in purple at each end of the bridal party head table. 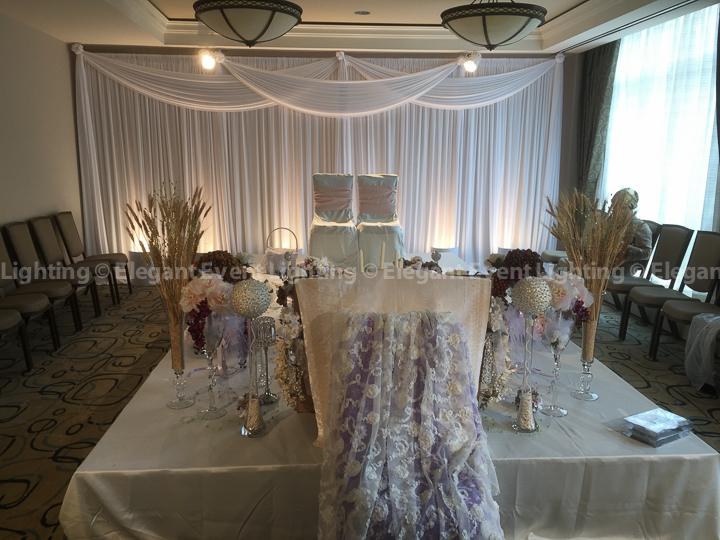 Every detail of Amanda & Steve’s wedding lighting and décor design was perfectly tied together and completely personalized the Marriott Burr Ridge Ballroom for their wedding! Click here to learn more about Amanda & Steve’s Wedding Ceremony & Reception Room Transformation! Which room transformation is your favorite? Tell us in the comments below!